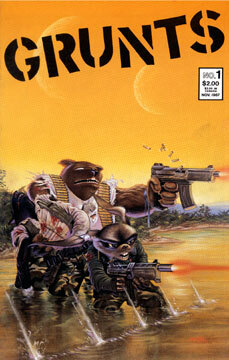 This was a one-shot anthology book that featured a bunch of different artists/writers telling anthropomorphic war stories. There aren’t any TMNT tales in this comic, but there is one story by Peter Laird that features the Triceratons, so I thought it should be included on our site. “FAK-II” by Kevin Eastman, Eric Talbot and Steve Lavigne. 6 pages. “My Friends Call Me the Lucky One” by Jim Lawson. 5 pages. “The Last Time I Saw Tommy” by Josh Quagmire and Dave Garcia. 4 pages. “The Horror” by Bella. 8 pages. “Jonesy” by Bill Fitts. 2 pages. “The Lesson” by Peter Laird. 10 pages. “The Bells” by Steve Lavigne. 6 pages. “Turtle Troop” by Mark Bode. 2 pages. “Monuments” by Michael Dooney. 6 pages. “Mekong Delta Blues” by Jim Groat. 4 pages. “Slaughter Dogs” by Eric Talbot. 5 pages. “Iron Angel” by Jim Groat and Phil Morrissey. 8 pages.